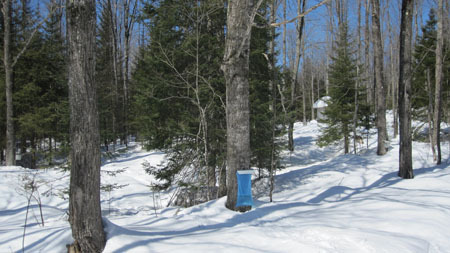 As I’m hiking out to the sugar bush during the syrup season, I begin to wonder what sort of sap run to expect. My equipment consists of 60 metal buckets and 3 sap bags. The bags have a lot going for them, foremost in my mind is that I can tell from a distance how much sap has accumulated since my last gather. This year, instead of positioning the sap bags just anywhere in the bush, I put one of them on my best tree, which also happens to be one of the first ones I see as I’m walking out to the operation. I put my second bag on his neighbor, which has an average run each year, and is pretty close to the first one. That way, as I’m walking out, I get some clues for what I’ll likely be up against. As you can see from the picture, there was a pretty good run that day, so I planned accordingly. And the run wasn’t a frozen block of ice, as it has been on many of my gathers this season. My metal buckets are all tapered, so I can usually coax the ice out by tapping the bottom of the pail. The bags, though, require me to take them apart and gingerly slip the block out of the bag. I have to be careful because even though the plastic is tough, I can tear it with the ice, thereby making the bag useless. This entry was posted on Thursday, March 28th, 2013 at 8:42 pm and is filed under Uncategorized. You can follow any responses to this entry through the RSS 2.0 feed. You can leave a response, or trackback from your own site.